The Pirates were like a good Chinese restaurant yesterday. The food was amazing, but the fans and players all left still hungry. Breakfast started off with the Pirates picking up Keone Kela (terrific name), lunch was served with a Tampa Kung Pao by the name of Chris Archer and dinner happened to be a three-course meal with dingers, double-plays and overturned third-base calls that capped off with a win against a division rival. Francisco Cervelli said it in the best possible fashion at the end of last night's 5-4 W, by simply stating "Because we are good." It's something that was said matter-of-factly, backed by confidence, encouraging for fans to jump right in the pool rather than toe-dip. Just a statement like that combined with a cornerstone day on the trade market packs a punch that fires up the clubhouse and reignites the fans' interest. It's wild to think how different the vibe was from the beginning of this season to now (even if many of us continue to step with trepidation like a dog that's been beat too much). The excitement that Chris Archer already has for Pittsburgh also adds to the hunger pangs of pursuit. He's already jamming to Wiz Khalifa and asking about good coffee joints as the team is welcoming him with open arms. 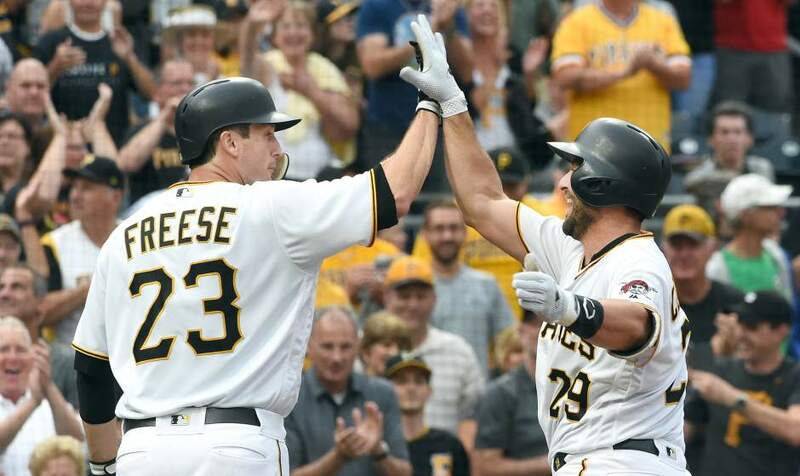 Former utility man turned third baseman David "'The Iceman' Dean Malenko" Freese has been on a tear as of late which is fitting considering how unabashed he was in taking the Bucco brass to task after what was a bummer of an off-season. David Freese during the Pirates' 16-4 stretch: .390/.468/.610, three doubles, a triple, two homers, six walks. 16 out of 20 is a real fine number. One that's filling, but not yet totally satisfying. And instead of ordering takeout like a lot of the fan base has been doing for the first half of the year, if the Pirates continue at this rate, then people may have to start making reservations.